The Aceple (R) brand is a registered trademark and this product is designed by us originally. Our Grow Lights can be applied to indoor gardening and hydroponics plants. This LED grow light would provide your plants with just what they need. That means providing them with the light that they need the most, in the form of blue and red spectrum lighting . Three ways to fix the clamp (Clip, Screw or Stick) - Easy to install at your home or office. ADJUSTABLE and FLEXIBLE GOOSENECK ARM - to position the light in any direction. Plug in and switch on/off - convenient and quick to serve your plants. Best for your tabletop plants - Energy saving, low heat and low power consumption but very effecient Red and Blue lighting. 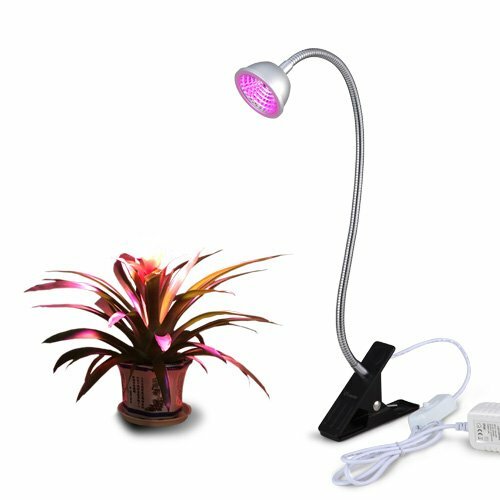 It provides you a special spectrum(including 460nm,630nm and 660nm wavelength), that Blue light is good for healthy leaves, and Red light is best for blooming and fruits. Smart desk lamp - 15.8 inches Gooseneck arm, Clamping range up to 2 inches and Cord length 59inches. RELIABLE CUSTOMER SERVICE: Respond within 24 hours, 30-day money refund guarantee, 1 year replacement warranty and lifetime support guarantee. If you have any questions about this product by Aceple, contact us by completing and submitting the form below. If you are looking for a specif part number, please include it with your message.